The Museum opened in its new home in 2003. The special exhibition, when we visited it, was William Dunlap’s “Panorama of the American Landscape,” a fourteen-paneled work. Half of it depicted a snow-covered landscape in which a row of deer heads continued into infinity. According to the curatorial note, the deer heads stand for the human casualties at the Battle of Antietem during the Civil War. The other seven panels of the panorama were verdant, with two horse-riding hunters in the background, and a troop of hunting dogs occupying much of the foreground. Winston and I have been in New Orleans for five days now, and we’ll be flying back to NYC tomorrow. The idea of a working vacation has been a success for me. I spent the mornings revising and rearranging Payday Loans, my 30-sonnet sequence, for publication in January. It helped to have a spacious hotel room to work in, $75 a night at the Sheraton, and not some quaint but claustrophobic bed-and-breakfast. Afternoons saw us wandering round different neighborhoods: the French Quarter, the Garden District (where we saw Anne Rice’s house, Rosegate, and Lafayette No. 1 Cemetery), Uptown, the Faubourg Marigny (with a gay bookshop, to our surprise), and the Warehouse District. I will be away in New Orleans from Christmas Day to the day before New Year's Eve. My first visit to that city, and I am looking forward to tramping round it, eating Cajun and Creole food and hearing some jazz. And doing some writing and reading in the mornings of the 6-day vacation. On Friday, I viewed the Met exhibition on German portraits by artists such as Otto Dix, George Grosz, Christian Schad, Rudolf Schlicter and Max Beckmann. Known as the Verists, a branch of the New Objectivism, the artists prided themselves on depicting their subjects dispassionately, even cynically. Such "realism" was deemed the only adequate response to the crises of German society after World War II. Terry Eagleton on "How to Read a Poem"
I'm enjoying this how-to book quite a great deal. Eagleton combines close reading of famous poems with a quick overview of poetic theory and criticism, in the belief that close reading and theory must inform each other. He is particularly good on the semiotics of YuryLotman. The style is witty and opinionated. Eagleton defines a poem as "a fictional, verbally inventive moral statement in which it is the author, rather than the printer or word processor, who decides where the lines should end." He readily admits that the definition sounds "unpoetic to a fault," but defends it as "the best we can do." Last Sunday, I saw two exhibitions at the Brooklyn Museum: Ron Mueck and Annie Leibovitz: A Photographer's Life, 1990-2005. 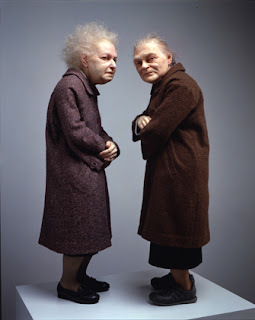 Mueck made puppets for children's television before moving to sculpture, while Leibovitz's photos first appeared in Rolling Stone, Vanity Fair and Vogue. Both artists thus began their careers in popular culture before they were taken up by the mainstream art world. I want to live with a beautiful man. I want him so badly. and my heart rose like a choir. and there the beautiful man keep. All day I want to live with a beautiful man. All night I lie down with me. but when did we start starving babies? Look! When I spin very fast, the mobile stars revolve round me. A friend, Kate Irving, sings in the New York City choral group, The Canticum Novum Singers, founded and directed by Harold Rosenbaum. On Saturday, the Singers performed a concert of carols at St. Paul & St. Andrew Church, and Mark Nickels was kind enough to ask for me, and Kate kind enough to give, a complimentary ticket. The sixteenth century Spanish carols, which opened the concert, sounded as if they were inspired by folk songs. They seemed to be suffused with a ruddy good cheer, and a wild rural spirit rattled out by the tambourine. I really enjoyed the two works of Josquin des Prez (c.1440-1521), especially the Ave Maria. The soprano voices soared with such purity till they appeared to be coming out of the mouths of the two full-sized, wing-extended angels high up on both sides of the altar. On Saturday I saw Fred Sandback’s work in David Zwirner gallery. An American artist (1943-2003), Sandback composes sculptures made of “lengths of yarn stretched horizontally, vertically, or diagonally in a variety of configurations that include rectangles, triangles, U-shapes, and floor-to-ceiling vertical lines” (exhibition press statement). The works in the exhibition range from wall reliefs to whole-room installations. I like the installations that “inhabit” a whole room. Though yarn is such a lightweight and thin material, the lines are not overwhelmed by the space; instead, the colored lines divide and multiply one’s perspectives of the pure white room. found in the flat dirt of the camp. like touching glass, hand in a glove. or paper torn out of a journal. bride-to-be thanked all the soldiers. sampans ride the harsh glint of the sea. Fires in the water are ghosts of the sun. smelling of fish, motor oil and tarpaulin. Their hands are empty trawling nets. The sea hawks its old throat and spits. some years too young to launch a boat. soles, so as not to disturb him. children, the man she lets him sleep. her eyes last night. They kiss her, leave. he lies awake, picks up her bag. the children ate nothing for lunch. home twice, during her lunch and break. those long hours making someone happy. editors enclosed in my self-addressed envelopes. of no to poems posted with thirty-nine-cent hopes. A few took the trouble to scribble their subjectivities. the flirt, the grovel, the hurt valve, or the soft core. face up, raised by the others sleeping facedown. in its brevity, added an afterthought, Try usagain. ember burns in a shoebox, because of this one. On Saturday I heard my friend, Greg Bynum, play his recorder as a guest with the Brooklyn Baroque at the Morris-Jumel Mansion. The details of the concert program are below. Greg was the soloist in Boismortier’s Sonata in G Major for Recorder and Continuo. I thought his playing was particularly fine in that sonata, natural and sweet. The soprano, Elizabeth Baber, sang the Bach and Telemann much better than the Scarlatti, to my untrained ears. Her voice was controlled and expressive, her interpretation of the Germans dramatic and persuasive. I thought, with her flowing blond hair and strong features, she looked like a Rhine Maiden. Greg’s playing in the Telemann matched her expression and intensity. I really like the Telemann piece, with its lurching rhythm in the opening lines. Mark Nickels wrote a poem for me. I think this is the first poem someone wrote for me, not counting verses penned by my students on cards. "Then hump in the catacombs while the highway thrums" is my kind of a line! During last weekend, I attended the Fair held at the Small Press Center. The Center is a member of the General Society of Mechanics and Tradesmen, a society whose quaint anachronism pleases me. The Fair itself was of a good size, with exhibitors in multiple rooms on four different floors. When I say "exhibitor," I really mean one table displaying the press's publications, ranging from one to, perhaps, twenty. I picked up a number of poetry books at a good discount: The Good Thief by Marie Howe, Sakura Park by Rachel Wetzsteon, Cinder by Bruce Bond, Poems of NazimHikmet translated by Randy Blasing and MutluKonuk, and Open Field: Thirty Contemporary Canadian Poets edited by SinaQueyras. The way from 190th Street Station to the Cloisters lay through Fort Tryon Park. The Park had a collection of heather that was as showy as that subdued plant could be: quiet mauvre, obscure yellow and pale green. Perched on a hilltop below which the Hudson and a busy motorway ran, the park was named after the last British civil governor of Manhattan. Isn't that a strange choice of name? The Cloisters itself was built, in the neo-medieval style, on the highest point in that area. I liked how the building incorporated into its own structure architectual elements from its collection. The Fuentiduena Chapel, with its high ceiling and half-barreled apse, was impressive.